Email Marketing Expert Dan Grech explains his one goal for 2017: 'Do less'. I've never really been a fan of ‘expert predictions’, especially when it comes to Digital Marketing. They remind me of Mystic Meg caressing glass balls, making some tenuous claims for the sake of entertaining an audience. I don’t think much will change in Digital Marketing in 2017. Like in previous years, email marketing will continue to hold the highest potential ROI against other marketing channels - yet so many businesses will get it wrong. Google will continue to make seemingly bizarre changes that we'll complain about - then we’ll accept them as being 'for the greater good' of online advertising. Video will continue to grow - yet people will scratch their heads at why a live broadcast of an eating contest on The Lad Bible's Facebook page gets more engagement than a 60 second YouTube pre-roll with a 6-figure budget created by the 'smartest' minds in advertising. These aren't predictions. This happens every year. Likewise, my goal for 2017 is exactly the same as 2016 and the years before it: I want to do less. You can label that an act of wisdom, or the attitude of a self-entitled millennial but it doesn't make a difference. Why do I want to do less? Because I have insight from some truly extraordinary companies. Companies that have the ability to attract unprecedented talent, with the ‘holy grail’ product formula and they are haemorrhaging hours. These hours become days, days become weeks etc. By the end of this piece you’ll learn about a technology that is saving a huge Supermarket at least 100 days a year. I am at war against manual processes. I don't believe any business should introduce a new process without consideration on how to automate it, whether that’s via internal resources or collaborating with third parties. There is value proposition that can calculate a budget for any manual process that costs your teams’ time. Sure, customer service, influencer outreach, copywriting... not every role is at hand to be automated with finesse. But I know from first hand experience that some of most valuable marketing channels are being driven through hours of manual CSV work. Juniors/freelancers/interns, extracting CSVs of personally identifiable information about customers from one system, running some queries and cleaning, then uploading it to another system - often an ESP. Sounds familiar? Then - they must manually create content blocks, countless dynamic rules for each email. How granular do some take it? Down to category propensity, size & colour preference. That’s a lot of SKUs. Then, if there’s a price change or product sells out they have to go back in and repeat the whole process from scratch! Consider that our teams are spending all this time to cater for segments or full mailing list where on average the open rate is just 25%. There’s only so much our IT teams can do for us - but they are incredibly time-poor too. These experiences motivated me to ‘scratch my own itch’ and solve my problem. Since IT and Marketing roadmaps can be misaligned and marketing projects can take, well, years - I decided to consult a trusted third-party. I laid down out all of our frustrations frankly, from the lack of IT resources, to internal systems written in out-of-date code by employees who left years ago. There was also the hurdle of the leadership's desire for exceeding growth targets with spending cuts. I was hunting for a silver bullet to reduce the hours my team were spending in these awful spreadsheets, with relatively low investment that didn't require scheduling huge IT work. A year ago, in Janurary 2016, I learnt that my woes correlated with much of Kickdynamic's customer and prospect base and they were fixing these problems with a new Content Automation product. Here's the TL;DR: Kickdynamic picks up subscribers propensity to buy certain categories, sizes and colours through their previous behaviour and displays the most relevant products in newsletters. The product stock, deals, pricing is all correct at the time of opening the email. It’s a one-time setup, data is then fetched from an API or feed then converted into marketing assets in milliseconds. 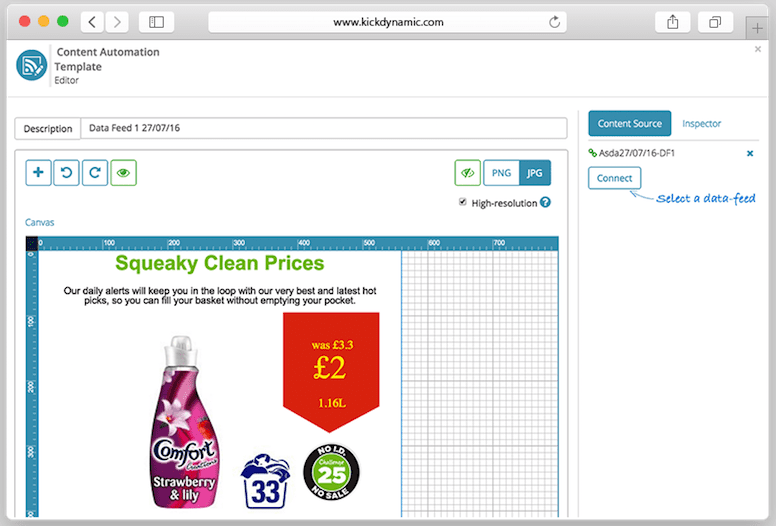 I caught up with Kickdynamic recently to learn that this product has since been a big hit for Asda's CRM team - saving them 2 days a week using Content Automation. 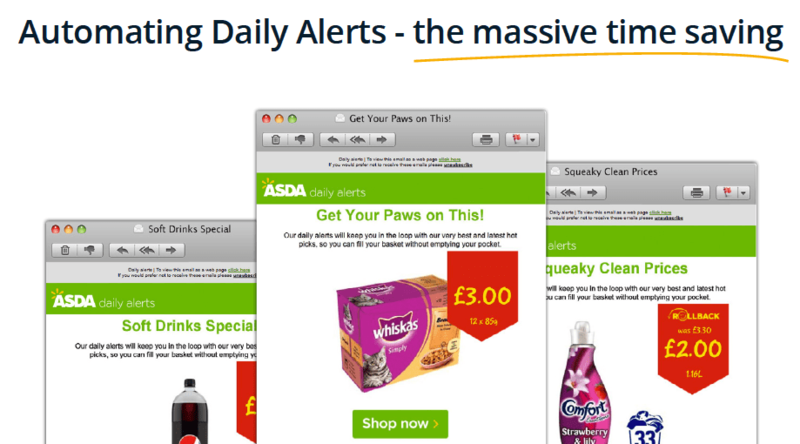 Asda’s ‘Daily Alerts’ show the best deals and Rollback items available online - naturally the process for building each email was long and intricate, taking four days and involving a cycle of activities under threat of those dreaded last minute changes. Now, any price changes to products featured in emails that have already been sent can be updated instantly. There are a growing number of 'contextual' email marketing products from both ESPs and start ups but this is the first product that I've seen that integrates fairly seamlessly and has a real commercial value that can and should be used in weekly newsletters, if not daily alert. Access to meaningful data and team resource is a common bug-bare across all the e-commerce retailers that I've met in the last 18 months and Content Automation kills two birds with one stone. So again, why do I want to do less in 2017? Because I can.